As materials essential for construction, such as different types of wood, continue to rise in value, savvy homeowners and businessmen are turning their attention towards demolishing and rebuilding rundown wooden houses using concrete and steel foundations while also seeking a small profit out of re-selling leftover wood. Toul Kork resident Sa Kun told Post Property of her recent experiences in selling her own worn-down wooden house, adding that her family had also decided to tear down and rebuild another house that she had been living in for ten years. “When we decided to rebuild the house, I had a discussion with the construction crew in order to learn the price of the various construction materials, as well as the fee for the construction crew,” she said. 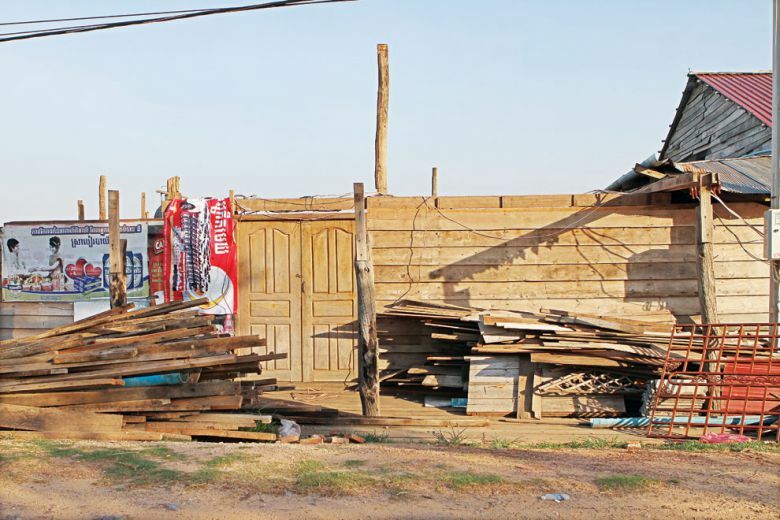 A few days after that initial conversation, Kun said a group of customers from Svay Rieng province contacted her asking to see the wooden houses she was planning to renovate into concrete houses. Kun gathered that she could potentially sell all the old wood remaining from her house for at least $1,000. However, Chan Heng, a construction foreman, said from his observations, it was best for homeowners to sell their houses before they got rundown. “People should sell their houses in good condition, instead of tearing them down just to scour wood for profit as construction crews tear down houses without thinking about the quality of their work,” he said. According to his own evaluation and estimation, Heng claimed that only 50 percent of good quality wood will remain after a wooden house is demolished, due to decay and damage. Moeun Sarath, who has been working in the construction sector for the past 10 years, told Post Property that the success of flipping old wooden houses was reliant upon the type of wood that was used in the original construction. Recounting his first experience with rebuilding wooden houses, Sarath said that during the late 1990s his aunt purchased old houses from locals in the district of Oral in Kampong Speu province and then used some of the materials from the old houses to build new dwellings. “Not many people in the area buy brand new houses from developers,” he continued. Sarath said at the moment, there were a lot of people in Phnom Penh looking to buy and sell old wooden houses in a bid to gain a tidy profit. This entry was posted in construction, Development, Electricity, environment, Phnom Penh Post, Property, Protery and tagged Cambodia, Construction, Development, Phnom Penh, Phnom Penh Post, Property. Bookmark the permalink.